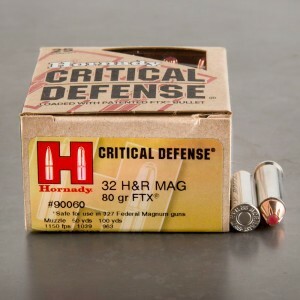 32 H&R magnum ammo is a relatively new round developed in the 1980s on a joint development deal from Harrington and Richardson and Federal cartridge company. The 32 H&R magnum was designed to offer a small concealable revolver with more punch than your standard small bore revolvers. The design was advanced enough to offer 38 Special energy levels with ability to squeeze 6 rounds whereas a similar sized 38 special could only hold 5 rounds. The 32 H&R mag is a lightweight round that can that offers low recoil with high enough performance to be a capable self-defense cartridge. The round is known to be a solid penetrator, and can reach velocities of up to 1200 feet per second from short barreled concealed carry weapons. While the ammunition was designed as a small, controllable, and concealable weapon the round has been proven to be a decent hunting round. Marlin produced a lever action 1894CB rifle that was lightweight and capable of holding ten rounds of ammunition. This cartridge in a rifle became known as a reliable small game cartridge for rabbits, coyotes and etc. 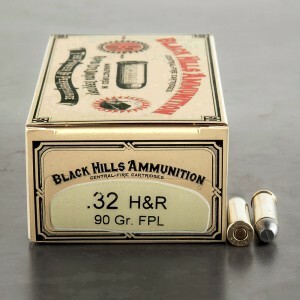 The 32 H&R offers an advantage over the 22 magnum by being a more reliable centerfire cartridge that can be reloaded. This works great for practice in my Ruger .327 magnum, with a lot less recoil, so that my daughter can enjoy shooting it as well. Fired 50 rounds through my single seven and everything worked as it should. This ammo is much cleaner than the 90 grain cowboy loads from the same manufacturer. Everything seems to work fine. They have a little more kick than with Hornady, critical defense. The price and delivery was decent.